It’s Jan 2 most places, but since I haven’t gone to bed yet, I’m going to claim it’s still the first day of a new year. For me the first week of January always means 1 thing: A dead news feed and pre-conference chaos. You see, next week is the annual Winter Meeting of the American Astronomical Society. I and about 2000-3000 other astronomers and science journalists are going to descend in mass on Austin, Texas. I have my name on two posters: 1 lead authored by my student Brian on the trials and tribulations of trying to herd data on galaxy evolution out of the literature (and how it is really better to just go use SDSS and work from scratch) and another on the International Year of Astronomy. Currently, I suspect there are about 1000 astronomers frantically working on talks and posters, about 1000 contemplating how they should be working on talks or posters, and a final ~1000 astronomers who aren’t presenting or who actually (gasp of horror) got things done ahead of done. This means there are also at least 1000 frustrated significant others out there cursing their luck for being in a relationship with an astronomer because they are watching their SO work on a poster/talk or procrastinating on a poster/talk when every other sane person is enjoying a holiday. I still haven’t sent Christmas cards. They will go out after AAS. I am a terrible human being at times. Luckily, my press feed shows a sum total of 2 astronomy science releases for the past week, so I only have mild guilt for not blogging (and really – shouldn’t you be eating cookies and enjoying Federal Holidays instead of reading blogs?). Here is all the astronomy science news the news feed felt the need to report:Â¬â€ 1) In case you missed the coverage on every news outlet I’ve turned to in the past week, there is a meteor that may crash into Mars on Jan 30, but will most likely sail past at a distance less than 30,000 miles but greater than 0 (I’ll blog on this that week, when we have better orbital info), and 2) Jets from young stars are proven to spiral. There was also news that Deep Impact, the little comet explorer that can, is zooming past Earth on its way off to explore the greater solar system and another comet. Basically, it’s a slow news week. Those 2000-3000 astronomers mentioned above are all holding their results for next week 🙂 The press conference schedule is packed, I think my brain will just explode from trying to keep track of everything that will be going on, and I’m going to work hard to channel that explosion through this blog and Astronomy Cast. Fraser, Rebecca and I, along with our good friend Phil Plait, will all be there bringing everything to you (and with 4 of us working together, we can be in more than one place at a time). So, for those of you who are wondering, I’m one of those astronomers who is still prepping for the meeting (My SO is already in bed, and he’s being very understanding. This year isn’t as bad as most for him. Thanks to a later than normal start date, at least this year I won’t be at the conference on his birthday like I have been the past two years). One poster I’m working on exists as a complete draft that just needs made less text heavy, and the other poster, well… let’s not talk about that. I’m also madly trying to pull together a new website. (If you ever wanted to know if it was easier to install twiki or mediawiki, go with mediawiki. If you hate yourself, install twiki. If you can hirer someone who knows perl, twiki is probably better for project planning, it is just not pleasant to admin at all). Also in prep for the conference I’ve been pulling together stuff to give away and to point fans at. Astronomy Cast now has adorable buttons from ButtonStar (Hat tip to Swoopy), and anyone interested can buy Astronomy Cast shirts from zazzle. We’re getting fliers courtesy of GLAST, and for the first special 70 or so people who ask for them, we have lanyards (I’ll have them at the meetup). I want to eventually also do give away stuff related to this blog, but I have to admit, I don’t know what to do. I don’t exactly have a logo. I have a name in a cool font, and an avatar, but… . I really need a logo. And here is where you can get involved. 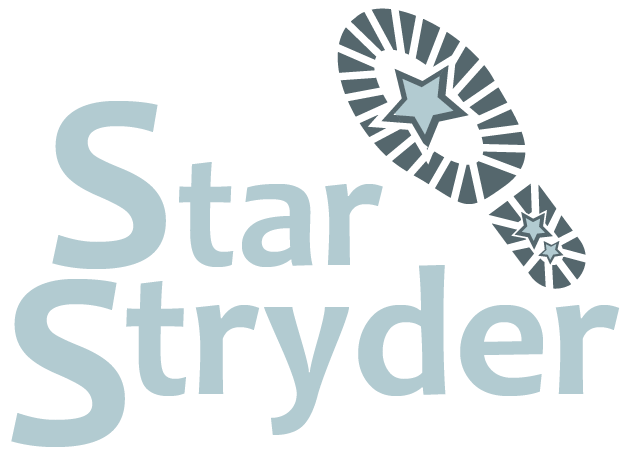 If you think you have an idea of a logo that would represent me, and can be square or rearranged into a masthead (like we do with Astronomy Cast’s logo), send it to me as a vector drawing in AI, EPS or PDF format AND as a gif, jpg or png at starstryder at gmail dot com. I’ll post all the (not offensive) logos I receive here on Friday. If I fall in love with one, I’ll use it and send you a copy of everything I print it on and give you credit at the bottom of the page. But it has to be love. True love of the – wow, OMG that is soo totally awesome, I want it plastered on my laptop so I see it every day. WOW thats amazing – love. We’re talking emotions, not logic, here. I’m a closet graphical artist who is utterly uninspired graphically by my own website. It’s pathetic. Can you inspire me? Try. Please. But for now, I should go back to fighting with websites. (Installing twiki without root access is a self-hating act). Happy New Year! I hope to see you in Austin! I don’t have meeting to prepare for… but exames… and they dare call this a holiday! Happy New Year Dr Gay! i hope it is a good one. I have to say that I like your avatar, fancy putting that on T shirts or coffee mugs? Happy New Year! Graphics sent. Thanks for adding the link to the IYA site. I’d rather forgotten to go there. It’s on my Mac’s Bookmark Bar now and it’s set for autofill on log-in. Hi,Aunt.I’m a senior student in China. Glad to visit your blog.You are a astronomer? Aha I like the Astronomical very well.When I was a child, I always watch the sky in the night.At the primary school I have read the book of Stephen Hawking. I think the astronomical and the Physics are also very interesting. Have a great new year, Pamela! I wish you all the best and good luck with Wiki system installation 🙂 I am having some headache with a new WordPress theme.. 10 liters of coffee and sleepless nights, my life as a software developer. Francis, I also like Hawking. His articles are interesting to read, as well as his books. Happy New Year (like everyone else said)! Hey nice post, and please make sure that you tell us all about the AAS meeting when you come back from it.